A practical synthesis for 6,8-difluoro-7-hydroxycoumarin-3-carboxylic acid – one of the most widely used coumarin fluorescence imaging dye for bioconjugation – is reported. 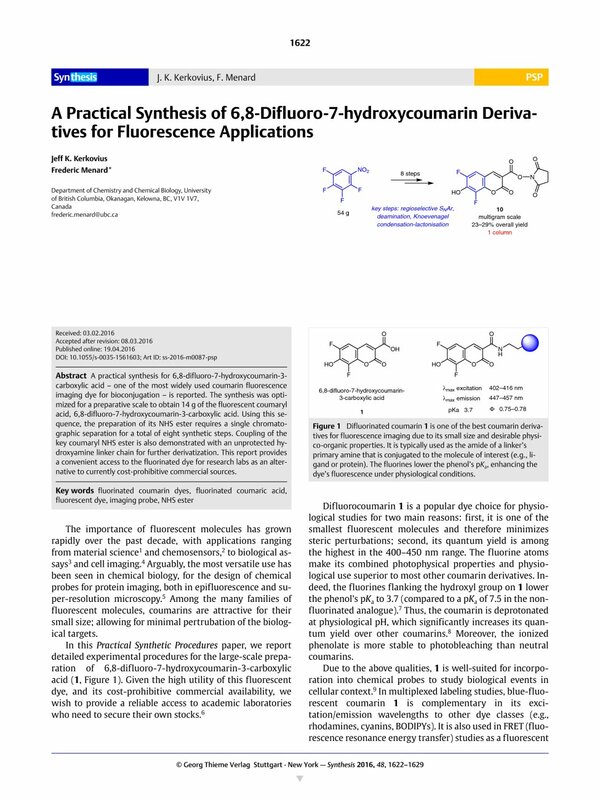 The synthesis was optimized for a preparative scale to obtain 14 g of the fluorescent coumaryl acid, 6,8-difluoro-7-hydroxycoumarin-3-carboxylic acid. Using this sequence, the preparation of its NHS ester requires a single chromatographic separation for a total of eight synthetic steps. Coupling of the key coumaryl NHS ester is also demonstrated with an unprotected hydroxyamine linker chain for further derivatization. This report provides a convenient access to the fluorinated dye for research labs as an alternative to currently cost-prohibitive commercial sources. Supporting information for this article is available online at http://dx.doi.org/10.1055/s-0035-1561603. 6 6,8-Difluoro-7-hydroxycoumarin-3-carboxylic acid (1), is commercialized under the trademark name Pacific BlueTM at a cost that is often prohibitive for academic research, who are arguably the most ardent users of such dyes as a molecular tool. For example, at the time of writing, the price of coumaryl NHS ester 10 was listed at 245 USD for 5 mg (cat. # P10163, ThermoFisher Scientific). 8 At pH 10, the quantum yield for ethyl ester 8 was determined to be 0.78, compared to 0.70 for the nonfluorinated analogue 1 (see ref. 7). 13 Coleman DJ, Naleway JJ. Patent PCT US 8460862, 2013 . Contains a preparation for 9, but no characterization data. 15 Full characterization of 1 has never appeared in the literature, despite its wide use for close to 20 years. Prior to this report, the only spectral data available for any intermeditate presented here were 1H and 19F NMR chemical shifts (without coupling constants). 16 While the transformations described herein are inspired by previous reports, several modifications have been made to enable a reproducible, large-scale synthesis of 1. 17 High pressure hydrogenation was used on a small scale (see ref. 13). 18 We found that the AcOH-solvated crystals of 10 keep the aromatic alcohol protonated, making for more stable long-term storage of the compound (the acid-free crystals of 10 are light green).